The park is located between the peaks of Mount Meru and Kilimanjaro, near Arusha. It has an area of approximately 143 km². The park is small and compact, but easy to reach from Arusha. It is green and lively, partly densely covered and hilly. There is a variety of flora (from tropical palm trees to highland vegetation), over 600 bird species (forest and mountain birds, water and pond birds) and numerous mammals (caffinians, zebras, hippos, monkeys, elephants). 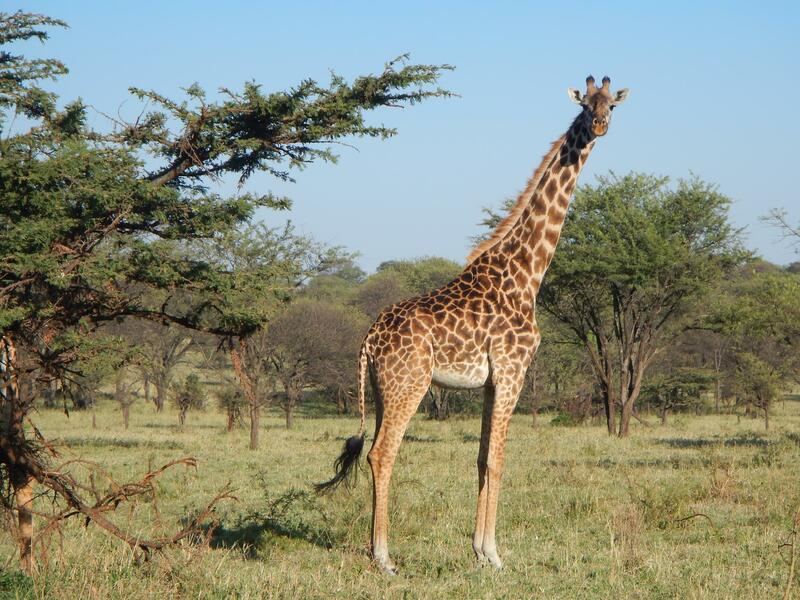 The Arusha National Park is the park with the largest giraffe population. Only the "Big Five" are not to be found here. The park has a charming landscape. For example you will find the Ngurdoto crater, the alkaline Momella lakes with their numerous bird species and Mount Meru (4566 m), the second highest mountain in Tanzania. An ascent takes about 3-4 days. You can go on foot safaris, game drives and canoe trips on the Momella lakes. The best travel time are the months June to February for tours to Mt. Meru (it can be rainy in October/November). The best views of the Klimanjaro can be enjoyed from December to February. The highest mountain in Africa presents itself as the crown of the impressive natural landscape of Tanzania. Perhaps you were lucky enough to see it while approaching Kilimanjaro airport. It is the highest stand-alone volcano on earth and has three different peaks - Shira (3962 m), Kibo (5895 m) and Mawenzi (5149 m). There are trekking tours to the summit. The ascent takes 5-8 days, depending on the tour and physical condition. The mountain is divided into five vegetation and climate zones (each is about 1000m). Each zone is subject to the respective interaction of temperature, altitude, rainfall, sun and soil. The vegetation changes from fertile volcanic soil and pasture, over rain forest to heath and moorland and highland stone deserts to the arctic zone of the summit. Many animal species such as elephants, giraffes, lions, antelopes, leopards, but also black and white colobus monkeys live primarily in the forest belt. The park has a size of approximatly 755 km². The Mkomazi National Park with its 3500 km² is Tanzania's youngest national park. In the north, it merges with the Tsavo National Park on the Kenyan side and is limited by the Pare and Usambara mountains in the south. The number of animals has increased significantly in recent years. Tanzania's largest population of Gerenuk antelopes is here, but also lions, cheetahs, elephants, buffaloes ...... .. and over 400 different bird species. A private rhino sanctuary with animals from South Africa as well as a breeding station for wild dogs was build and can be visited on request. Tarangire National Park is located about 120 km from Arusha in northern Tanzania and has a size of approximately 2,800 square kilometers. It lies between 1000 - 1500 m above sea level. 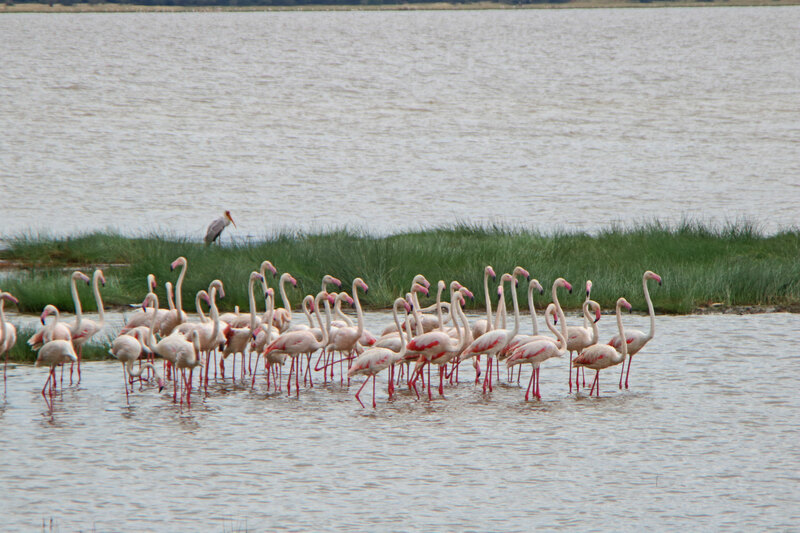 Nearby is the Manyara Lake. The park consists of tree savannah, wetlands and grasslands. 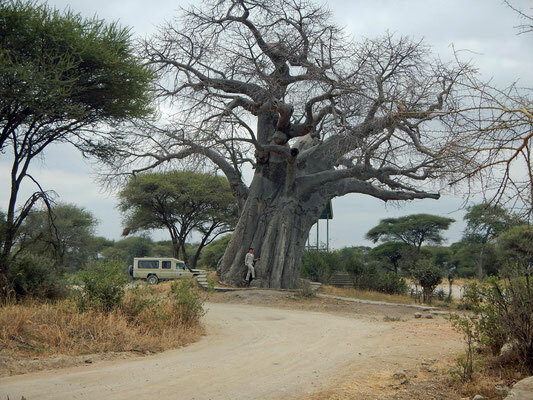 The park is famous for its many baobab trees. The Tarangire River, which carries water almost all year, flows through the park. 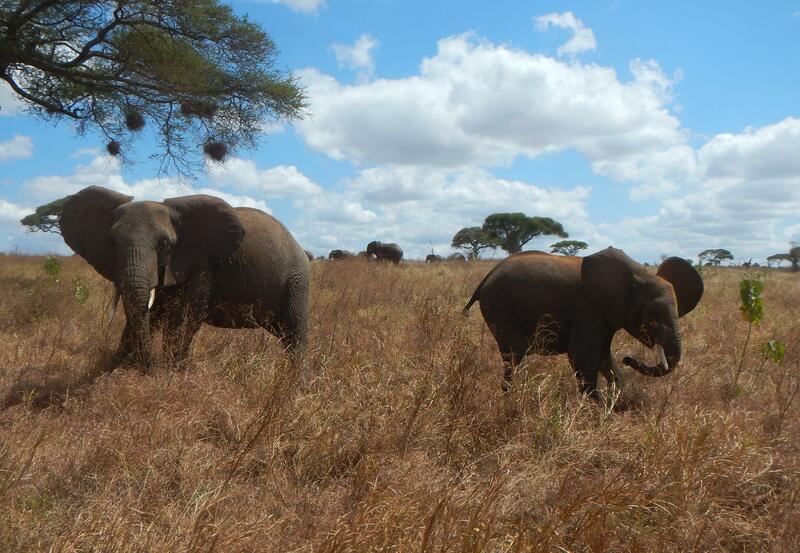 In Tarangire there is the largest elephant population in the north of Tanzania. It is also known for its pythons that wind around the tree branches. The Tarangire Park has an abundance of wildlife to offer, such as: antelopes, gnus, zebras, impalas, ostriches, giraffes, gazelles, waterbucks, dikdiks, lions, leopards, cheetahs, hyenas, hippos, etc. Because of its marshes, the Tarangire National Park also has a species-rich bird life to offer, up to 500 species, including hornbills, various heron species, ibis, pelicans, mules, eagles and vultures. Here you can make jeepsafaris, guided foot safaris as well as trips to Maasai villages and rock drawings. The park can be visited all year. The dry season (June to October) is the best time to visit. Because of the begining annual animal migration, large groups of animals can be found then. The Usambara Mountains are located in the north-east of Tanzania in the Tanga region, not far from the coast of the Indian Ocean and the border with Kenya. The Usambara Mountains are divided by the Lwengera River into the densely wooded East Usambara and the West Usambara mountains, which are about four times as large. The highest peaks of up to 2300 m (Chambolo) can be found here. Above 2000m there can be light frosts. The cool, fresh mountain air seems anything but African, offering a change to the dusty heat of the savannah. The Usambara mountains are a little visited mountain landscape, but an eldorado for hikers. In both parts some very old rainforests, which are many million years old and very species-rich, can still be found. Many plant and animal species are endemic. The most famous endemic species is the African violet, the Usambara Uhu, the red Usambara bird spider, but also chameleons, different colobus monkeys or rare butterflies. The Pare Mountains are located in the north-east of Tanzania, northwest of the Usambara Mountains. There is a northern and southern mountain range, which reaches with the Shengena Peak an altitude of 2463 m.
The Western Usambara Mountains are separated from the southern Pare mountains by the river Mkomazi. The northern Pare Mountains are located about 35 km southeast of the Kilimanjaro. Beautiful walks through forests to waterfalls like the Thornton Falls can be made here. The waterfall is one of the highest in Africa. It is possible to climb the Shengena Peak, but there are also hikes to different viewpoints with beautiful views to the plains of the Mkomazi national park. Visiting the mountains is also worthwhile for historical and cultural reasons. The people of the Pare offer deep insights into their tradition and family structures. Their life differs from other Bantu peoples of the country, as it stands for a mountain culture. The national park is located in the north of Tanzania and has a size of 330 km². The largest area is Lake Manyara. The park is bordered by the cliffs of the Great Rift Valley to the west and by Lake Manyara to the east. It is located about 120 km west of Arusha in the immediate vicinity of the city/village Mtu wa Mbu. The park is located at 960 - 1828 m above sea level. It is known as the filming location of the Hollywood classic "Hatari" with Hardy Krüger and John Wayne. A panel at the entrance of the park is reminiscent of the film heroes. To the south of the park are the hot springs "Maji Moto" in Kisuaheli. The name of the park comes from the Maasai word Emanyara, which describes an euphorbia species used by the nomadic people as a fence or shelter for their cattle. The park has a large variety of trees (e.g .mahogany, tamarind trees, sycamore trees) and soil plants (e.g. cypress trees, bushy hibiscus plants, ground cress), but also fig and palm trees, as well as grasslands. The park is known for its tree lions, which doze on the tree branches. 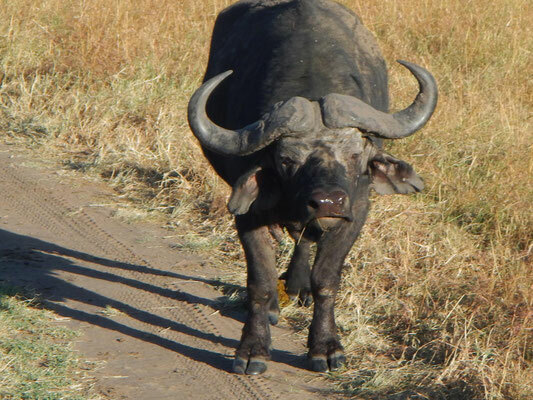 It also has a high elephant population, but also buffalo, impala and baboon herds can be found. There are over 400 different species of birds, such as flamingos, hornbills, storks, cormorants. Also zebras, hippos, giraffes and blue monkeys should not be forgotten. You can go on game drives, canoe trips (if the water level is high enough) or cultural excursions. It is best to travel between the rainy seasons, between December and March or between June and October. 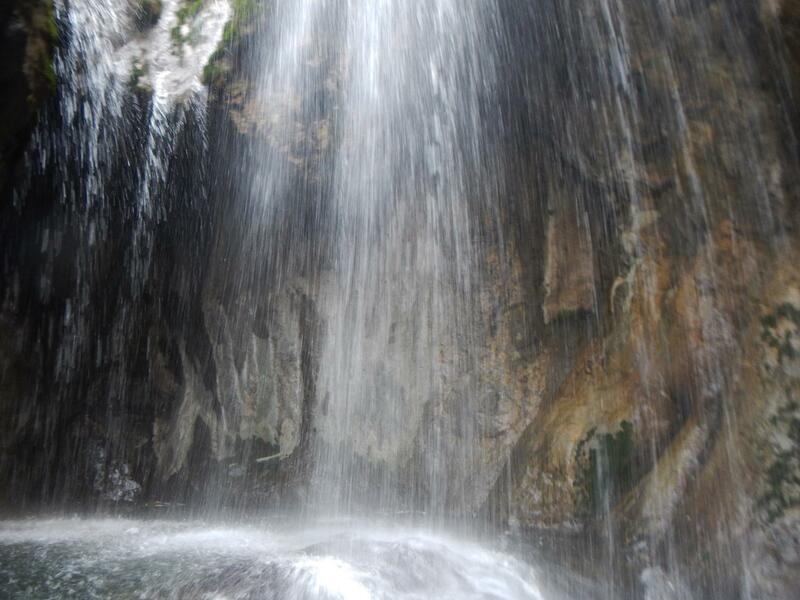 The rainy season can be used for bird watching, visiting the waterfalls and canoeing. In the rainy season, weather-related restrictions can be expected. The Ngorongoro Conservation Area is a protected area and a world heritage site 180 km west of Arusha. The area is named after the Ngorongoro crater, a large volcanic caldera in the area. The area has a size of 8288 km². The crater alone has an area of 304 km². It borders the Serengeti in the north-west and the Ol Doinyo Lengai, the holy mountain of the Maasai, in the north. Approximately 56.000 Maasai live here in harmony with the African animal world. The respectful coexistence of humans and game is unique in the world. The crater has a diameter of 20 km. The crater edge lies at an altitude of 2300 m, while the crater itselfs is about 610 m deeper. It is the largest non-water filled caldera in the world. The crater floor is mainly covered with grassland. In the heart of the crater lies the sodalake Magadi.Volcanic ash deposits are the cause of its alkaline water. The Ngorongoro crater is home to a large animal world. With some luck even the famous "Big Five" can be found (lion, rhino, elephant, buffalo, leopard). Depending on the season, there are 15,000-25,000 animals in the NCA, of which two thirds are wildbeests, zebras, buffaloes and gazelles. The large number of grass-eaters in a relatively small area is the cause of the large lion population in Ngorongoro. Maasai giraffe, topis and impalas can not be found here, since they can´t get over the steep crater walls. It is also possible to hike on the edge of the crater. There is also a memorial for Michael and Bernhard Grzimek, who were buried in the crater. In the early 1960s, Bernhard Grzimek initiated the Serengeti Research Institute with contributions from the Zoological Society of Frankfurt, which had the aim to investigate the pathways and behavior of wild animals, thereby contributing to their long-term protection. The crater itself was declared a national park. In the NCA, on the way to the Serengeti, there is the Olduvai Gorge, which for a long time was considered as the cradle of mankind. It is a steep gorge in the Great Rift Valley that stretches along East Africa. Olduvai is located in the rainforest of the Ngorongoro highlands and is the driest part of the region. It is 100 m deep and 50 km long. Jeepsafaris inside the crater rim as well as foot safaris (with ranger) outside the crater can be made. Maasai villages can also be visited here. The park can be visited all year round. The dry season is from June to October. December to March, directly after the small rainy season, are also recommended. The Serengeti is Tanzania's oldest and best-known national park. It has a size of 14763 km², borders Kenya (Maasai Mara) to the north, Lake Victoria in the north-west and the Ngorongoro Conservation Area in the south. The Serengeti lies at an altitude between 1150 m (Lake Victoria) and 2155 m (Lobo Hills) above sea level. Serengeti derives from the Maasai word "Siringet" and means "endless plain". Serengeti - countless animal reports, not least due to father and son Grzimek with her film and book "Serengeti Shall Not Die", have ensured that the name has become the epitome of endless animal safari in Africa. Founded by Grzimek, the research station of the Zoological Society Frankfurt, headquartered in the Serengeti, is still conducting animal research in the Serengeti. Sometimes you can see a lion with a signal collar, which serves research purposes of the institute. Besides approximately 3 million larger mammals in the Serengeti, there are also about 500 different bird species. Also Reptiles, agamas and hyrax can be found here. In addition, the population of more than 50 other animal species very extensive. The main attraction are the big cats. There are numerous lions, leopards, cheetahs, but also various species of gazelles, impalas, antelopes, buffaloes, warthogs, hyenas, giraffes, crocodiles, ostriches and elephants. There are several rivers in the Serengeti, such as the Seronera River, Grumeti River (West) and Mara River (North). Bizarre Kopjes (rock clusters) stick out of the flat surface. The majestic lions reign the great plains, while the graceful leopards are stalking through the dusty orange acacia trees and cheetahs hunt their prey in the southeastern part of the Serengeti. A ubiquitous experience in Tanzania's largest national park is the struggle of life and death between predator and prey. In the Serengeti you can make game drives, hot-air balloon safaris, trips to rock paintings and Maasai villages. 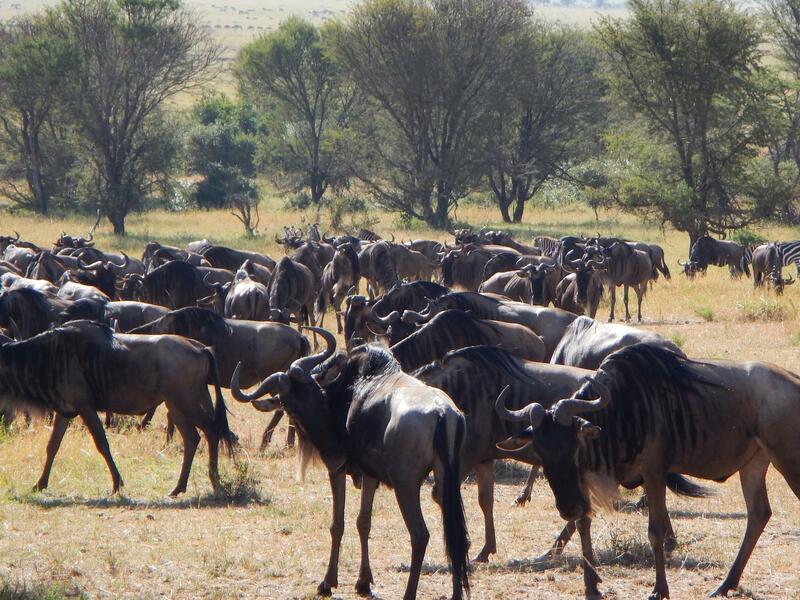 The best travel time to follow the wildebeest migration is December to March and June to July. In order to observe predators, June to October would be a good choice. Rubondo Island National Park is a national park in the north-west of Tanzania. It has a size of 250 km² and is located on the island of Rubondo in the southwest of Lake Victoria, 150 km west of Mwanza. Apart from the main island, nine small islands belong to the protected area. These islands can only be explored by boat and on foot. 90% of the park are wet forest, the remaining area consists of grassland, papyrus swamps and sandy beaches. Tamarind trees, palm trees, jasmine and 40 orchid species, among others, grow in the forests. Among the original animal species of the island are hippos, crocodiles, bushbucks and the extremely rare sitatunga antelope. It has distinctive webbed pair of toes and is therefore a very good swimmer. 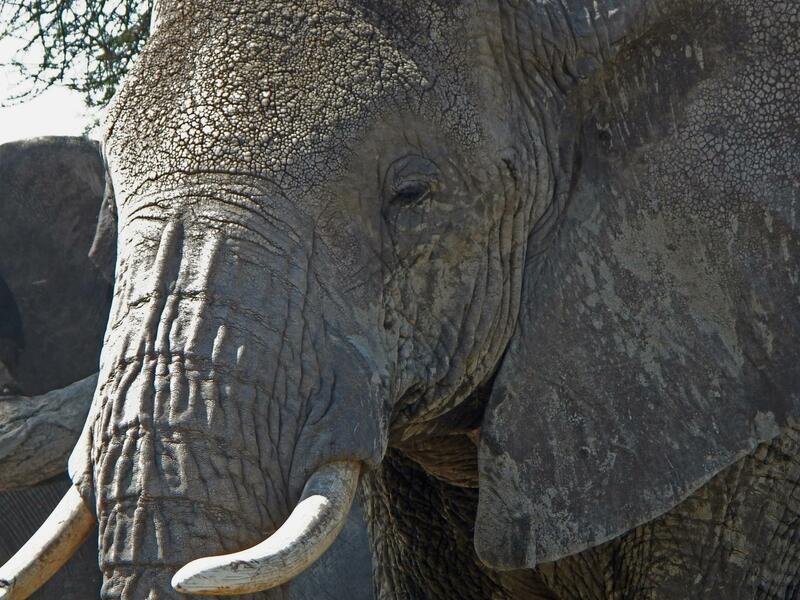 Elephants and giraffes are rarely found and there are no big cats in the park. Approximately 400 bird species are found on the islands. Subsequently, chimpanzees and black-and-white colobuses were settled here. Here you can make walking safaris, boat trips, sport fishing and chimpanzee tours by boat. Best travel time is June to August. The rainy season, November to March, is particularly worthwhile because of the wild flowers and butterflies. From December to February it is possible to observe many migratory birds. Gombe is the smallest national park in Tanzania with 52 km². It is located in the west of Tanzania, 20 km north of Kigoma on the shores of Lake Tanganyika. The park consists of a 15 km long stretch of tropical forest, covering the slopes and river valleys around the northern shore of Lake Tanganyika. Because of the large population of great apes, it is also called "Chimpanzeeland". Since 1960, the British Jane Goodall began to explore the behavior of chimpanzees. It is thanks to her that today we not only have an insight into the life of our close relatives, but also that the protection of the animals is more sustainable. While walking through the park, it is possible to get very close to the monkeys as they are accustomed to human presence. In addition to chimpanzees, you can also observe anubis baboons, red-tailed monkeys, red colobus monkeys, but also over 200 species of birds (e.g. fish eagles, red drottastril) and more than 250 different species of butterflies. Have fun while going on chimpanzee walks, hiking, swimming, snorkeling or watching the manufacturing of Dhows (wooden sailing boats). During the rainy season (February to June and November to mid-December), the chimpanzees are less likely on the move and can be found easier. However, the best photos originate during the dry season (July to October, end of December to January). The Mahale Mountains National Park is located on Lake Tanganyika in the west of Tanzania. It has an area of 1650 km², is located 150 km south of Kigoma and sticks out like a peninsula into Lake Tanganyika. The extremely steep mountains are green up to the heights and some peaks are even covered with grass. The highest mountain is Mt. Nkungwe with 2462 m above sea level. The land in and around Mahale is the traditional home of the Watongwe and Wakoloholo tribes. The park was created mainly to protect the remaining wild chimpanzees in Africa. Almost 700-1000 of these great apes are suspected in the slopes of the Mahale Mountains. 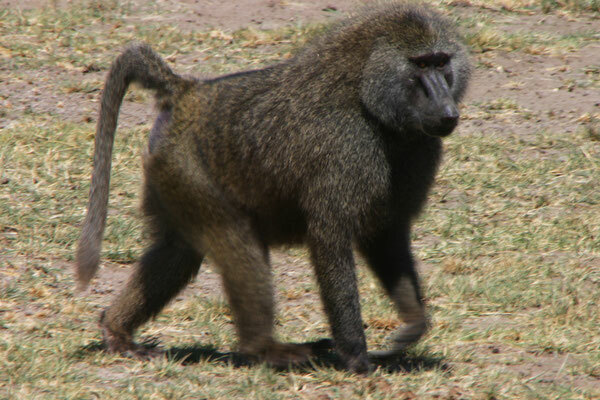 The Mahale Mountains are considered to be the southernmost spreading area of chimpanzees in Africa. In addition to the chimpanzees, there is plenty of big game in the park. Elephants, giraffes, buffaloes, zebras, kudus, antelopes, bush and river pigs as well as lions can be found east of the mountain massif. Mahlae is also known for its rich bird life (about 230 species). The Tanganyika lake provides habitat for about 250 different species of fish. Here you can go mountain climbing, snorkeling, fishing, kayaking or relax on unspoilt white beaches. It is possible to climb the summit of Mount Nkungwe. The ascent takes about 2-3 days. The dry season (May to October) is the best time for this. It is also the best time for forest hikes, but also during the "small" rainy season (November to December) it is possible without major problems. Due to the high rainfall in the big rainy season from February to May, visits to the the park are not necessarily recommended, as many paths are unpredictable. The Katavi National Park is a national park in the south-west of Tanzania, east of Lake Tanganyika, with an area of 4471 km². Here you can experience wilderness in an untouched scenery, since the third largest national park with its rich flora and fauna is rarely visited. Its varied landscape is dominated by a dense Miombo dry forest, vast marshes and grasslands, shrublands, lakes and rivers. The Katuma River, with its swampy plains, is the center of attraction for animal observers all year round. Nowhere in Tanzania there is a higher concentration of crocodiles hippos and buffaloes, with up to 1600 animals hovering over the grass ridges. You will also find roan and sable antelopes, giraffes, zebras, impalas, reedbucks, large herds of elephants, but also lions, spotted hyenas and about 400 different bird species. The most spectacular experience in the national park remains, despite all this fascinating biodiversity, the concentration of hippos. Nowhere do so many animals come together at the end of the dry season. The more hippos gather in one place, the more fierce do the territorial struggles become. It is best to travel in the dry season (May to October, mid-December to February). During the rainy season, the streets in the park are often flooded. The Ruaha National Park has been the largest national park in Tanzania since the annexation of the Usangu Game Reserve (2007) and the Rungwa Game Reserve. It has a size of 20,220 km² and is located 128 km west of Iringa in central Tanzania. Ruaha National Park is home to the largest elephant population in Tanzania's national parks. In the eastern part of the park the impassable, semi-dry Buschland is crossed by the Great Ruaha River. Depending on the time of the year, the river present itself differently: sometimes lush and filled up with water above the banks or narrow and shrunk to a precious water strip surrounded by dazzling sand surfaces. The river has created spectacular canyons and landscapes and is home to innumerable crocodiles and hippos. However,in the dense scrubland lurk lions, cheetahs, wild dogs as well as striped and spotted hyenas. Ruaha is the only national park where flora and fauna of southern and eastern Africa overlap. Here is the transition between the East African acacia savannah and the Miombo woodland belt of Southern Africa. Due to this fact, a large number of Antelope species live here. About 450 species of birds live in the Ruaha National Park, which, after the rainy season, turns into a magnificent, colorful sea of wild flowers. Here you can make game drives, day walks or foot safaris through unspoilt bushes. The "Stone Age ruins of Isimila", one of the most important historical places in Africa, is only 120 km away. The dry season (mid-May to December) is best suited for observing the predators and large mammals. Birds, lush landscapes and flowering wild flowers can be admired in the rainy season (January to April). The male large Kudu can best be observed during the mating season in June. The Udzungwa Mountains National Park is a 1900 km² nature reserve in the center of Tanzania, south of Ruaha National Park. The dense, foggy mountain rainforests of the Udzungwa National Park appear dark and primeval. The mountains rise up to 2579 m (Luhombero) above sea level. Plants and animals live here, which can`t be found anywhere else on the earth. Many of the plants growing here, including 30m high tree species – partly covered with mushrooms, lichens, mosses and ferns - are endemic. Therefore, this area is also referred to as "Galapagos of Africa". Two of the native primate species, the Uhehe Redhead Guereza, the red Colobus and the Sanje-Mangabe are found here. Ornithologists also get their money's worth and can discover over 400 different bird species in the park. Among them is the green-headed orifice, the endemic forest turnip. The Uszungwa National Park is not a typical destination for animal safaris, but rather a starting point for hikers and nature lovers. You can easily reach various attractions of the park on an excellent network of forest trails, such as the Sanje waterfall, which foamingly plunges 170 meters into the valley. The park is one of the rarely visited destinations in Tanzania. As there are no accessible paths in the entire park area, only guided walking safaris (with ranger) are possible. The park can be visited all year round, but in the rainy season the paths are often slippery. Dry season is from June to October. Also January to March is still recommendable. However, you should always be prepared for rain. The Mikumi National Park forms the northern part of the largest game reserve in Africa, the Selous Game Reserve. It has a size of 3,230 km². The park is also called "Little Serengeti of the south". The Mikumi National Park is crossed by a paved road connecting Dar es Salaam with Iringa. Mikumi is the Swahili word for the Borassus palm tree that grows in many places on the plain. The scenery is marked by Mikumi-alluvial and mountain ranges. The centrepiece are the big savannas in the Mkata Plains in the northwest of the park. The lions watch over their steppe-like realm and watch - sometimes from viewpoints high in the trees - as their prey (zebras, gnu, impala and buffalo herds) passes them. 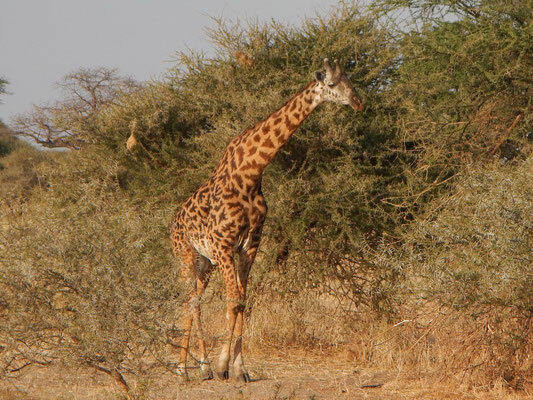 In the shady acacia forests along the Mkata River giraffes and elephants are often found. 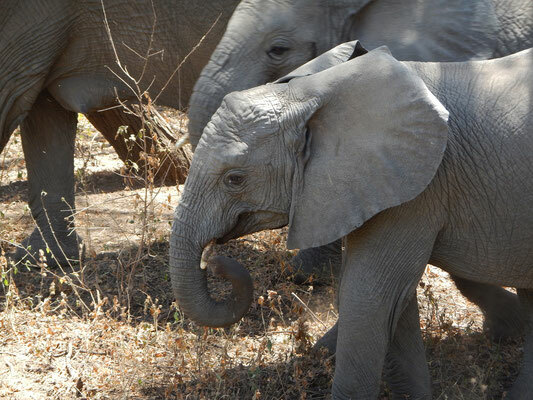 The Mikumi elephants are somewhat smaller than their relatives in the rest of Tanzania, but still easily surpass the largest landrover. Near the foothills of the Uluguru Mountains you will find kudus, sable antelopes and black-and-white colobus monkeys. Furthermore, baboons, waterbucks, bushbucks, reedbucks, hyenas, warthogs, jackals, sea cats, mangoes and more rarely cheetahs and leopards are seen in the park. More than 400 species of birds are found in the Mikumi, including very colorful representatives (for example lilac-breasted roller, yellow-throated pipit and bateleur eagle). During the rainy season many European migratory birds join them. The park can be visited year-round, the best travel time is June to November. The Selous Game Reserve is the largest wildlife sanctuary in Africa with 52,000 km². The area covers 6% of the land area of Tanzania. It was declared a UNESCO World Heritage Site by the UNESCO in 1982. In contrast to the other national parks of Tanzania, big game hunting is allowed in the rough and pristine Selou Game Reseve. Therefore, only the hunting areas north of the Ruaha River and Rufiji Rivers are accessible to safari tourists. More than three-quarters of the park is covered by dense Miombo dry forest, which presents an iridescent play of leaves from June to September. In the northern regions there are mainly grass and marsh landscapes, which are loosened by impressive monkey trees (baobab) and acacia trees. The Selous is home to lions, giraffes, zebras, baboons, impalas, a few headscarf horns and has the largest elephant population with about 60,000 animals. The Rufiji River is the main artery of the park, which stretches its path up to 100 meters through the landscape and serves as a habitat for many crocodiles and hippos. Large amounts of Doum and Borassus palm trees are typical for the Selous Reserve. The inland delta of the Rufiji River does not need to fear a comparison with the Okovango Delta in Botswana. More than 400 species of birds will bird lovers get their money's worth. The observation of the animals is partly complicated due to the dense vegetation, but a good guide will lead you to the right places. You can make jeep and walking safaris (with rangers) in the north of the park along the Rufiji River, as well as trips to the waterfalls of the "Stiegler Gorge" and fishing trips on the Tagalla Lake. The best time to travel is the dry season from June to February. In the second, more scenic and greener half of the season, small rain showers are possible, but do not affect the safari. This park was built in 2002 on the east coast of Tanzania and has a size of 1148 km². It is located 130 km north of Dar es Salaam, opposite to Zanzibar. It is the only park where you can combine game viewing and bathing fun, because with a little luck you can meet elephants, buffaloes and lions on the beaches of the Indian Ocean. Beach and bush meet harmoniously in Saadani. On safaris and hikes you can discover a variety of animals like giraffes, warthogs and waterbucks. Coyotes, wildebeest, redduckers, baboons, big kudus,antilopes, sable antelope, vervet monkeys, several prides of lions, leopards, spotted hyenas and black-backed jackals. The northern population of the Roosevelt Sable antelopes in Tanzania are located here as well. However, there isn´t quite the abundance of animals, which can be found in the other national parks of Tanzania. A further special feature are the giant turtles, for which the beaches of Saadani offer the last breeding grounds on the Tanzanian mainland. The best travel time for animal watching is January to February and June to August. In April and May the roads are sometimes not passable. The uninhabited lake is located in the north of Tanzania, in the north of the East African Rift Valley. It is about 60 km long and 20 km wide. 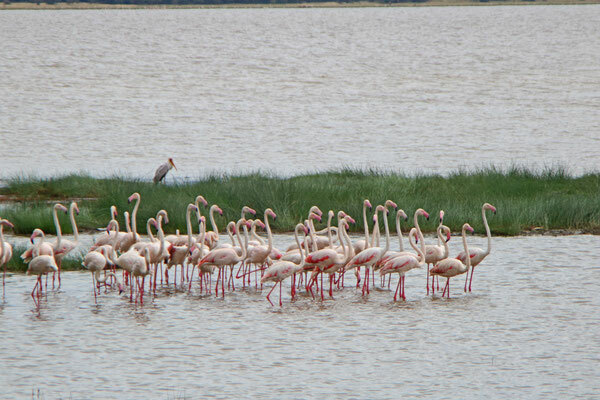 It is the only propagation area of flamingos. 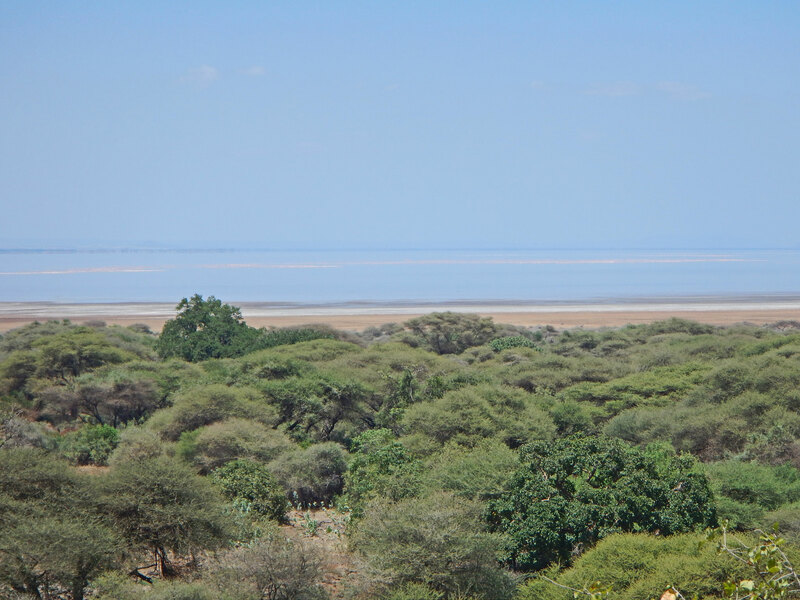 The lake is 300 m lower than Lake Manyara, also called the "glowing boiler". The oppressive heat and the shimmering surface of the flat, stifling salt lake recalls the Dead Sea. For the rose-red color of the lake, which is seasonal, single-celled algae Spirulina, with their purple bacteria are responsible. 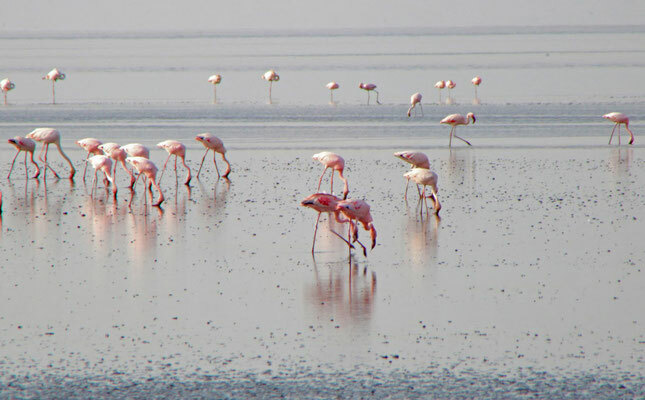 They are responsible for the pink color of the flamingos. Sometimes the Lake Natron dries completely. Then it looks as white as the Arizona desert. Since 2008, approximately 120.000-year-old fossil footprints of modern humans are analyzed that had been imprinted in fresh volcanic ash at what was then the edge of the lake. A total of 350 impressions on 150 m² have been verified. 20 km south of the lake is the Ol Doinyo Lengai (2890 m). The diameter of the crater is about 250 m and circular. It is the only volcano in the East African grave breach. Ol Doinyo Lengai is the only volcano in the world that ejects deep black lava. Inside it has a temperature of 550 ° C.
For the Maasai, the sacred volcano Ol Doinyo Lengai (the "Mountain of God") is the place of residence of their God Engai who protects the people and their herds, and sometimes demonstrates his power with its ash explosions. The volcano can be climbed on two routes. However, the ascent is very difficult, good perseverance, heat tolerance, step safety and dizziness are indispensable prerequisites. The ascent takes about two days. The Mt. Gelai massif, which rises over 2300 meters from the plain, occupies the eastern side of the lake. Its peak region is covered by a dense and pleasantly cool jungle, where like on a Noah's Ark elephants, buffaloes, bushbucks, leopards and others smaller animal species can be seen. 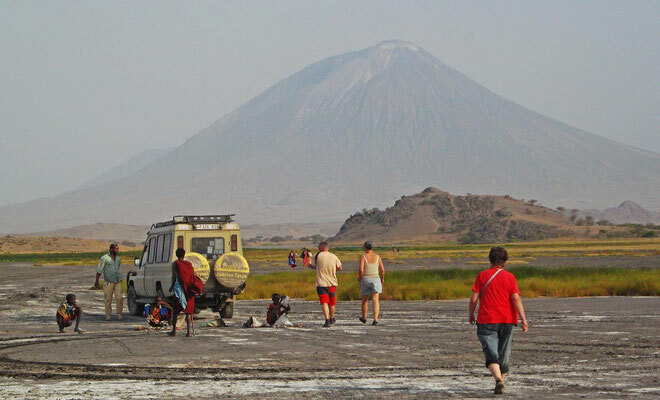 The drive to Lake Natron is uncomfortable, dusty and tedious. But the hardships are worth it, because in its cowardice and bizarre beauty the sight of this very special land touches its visitors. This is not the place to go to see the Big Five, but to get to know Tanzania off the beaten track.